程晓彤, 王菲菲, 陈枭, 侯文杰, 赵杨, 王欢, 王皖曦, 赵梦雪, 张晶轩, 杨国愉. 声音片段诱导的不同情绪背景对来源记忆的影响[J]. 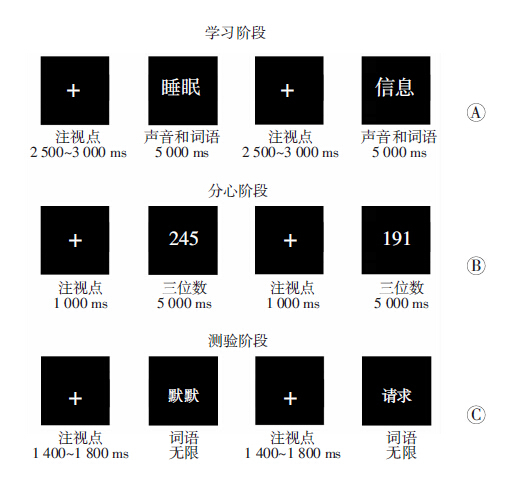 第三军医大学学报,2016, 38(22): 2470-2473. Cheng Xiaotong,Wang Feifei,Chen Xiao,Hou Wenjie,Zhao Yang,Wang Huan,Wang Wanxi,Zhao Mengxue,Zhang Jingxuan,Yang Guoyu. Effect of sound clips induced different emotion backgrounds on source memory[J]. J Third Mil Med Univ, 2016, 38(22): 2470-2473. [Abstract] Objective To study the effect of different emotional backgrounds induced by sound clips on source memory. Methods In this study, we used multi-key paradigm of source memory test, with a 2-factor (3×4) fractional design, to measure the subjects' reaction time and accuracy of source memory in different emotional background. The differences among different backgrounds/stimulations were statistically analyzed. Results Under 3 emotional backgrounds, reaction time and accuracy rate of the subjects responding to both correct and false sources differed significantly from those underwent new stimulus(P < 0.01). The reaction time and accuracy rate were also significantly different between the positive and negative backgrounds(P < 0.01)but not the emotional effect(P>0.05). Conclusion Under different emotional contexts induced by sound clips, source memory is more complicated and time-consuming than item memory even under the same stimulation. Moreover, the reaction time is prolonged when the source can not be extracted or the extraction is uncertain. Tulving E. Episodic memory: from mind to brain[J]. Rev Neurol Psychol (Paris),2004, 160	(4 Pt 2)	: S9	–S23. 韦洪涛, 孙新梅. 来源记忆研究综述:基于情绪状态、效价和唤醒度[J]. 苏州科技学院学报(社会科学版),2015, 32	(2)	: 84	–89. 聂爱情, 沈模卫. 来源记忆与情绪[J]. 心理科学,2007, 30	(1)	: 224	–226. 杨国愉, 张大均, 均张, 等. 国际情绪图片系统在中国青年军人群体的初步应用[J]. 第三军医大学学报,2010, 32	(18)	: 1998	–2001. 程晓彤, 王菲菲, 陈枭, 侯文杰, 赵杨, 王欢, 王皖曦, 赵梦雪, 张晶轩, 杨国愉. Cheng Xiaotong, Wang Feifei, Chen Xiao, Hou Wenjie, Zhao Yang, Wang Huan, Wang Wanxi, Zhao Mengxue, Zhang Jingxuan, Yang Guoyu.